Though September marks the beginning of autumn for residents in many parts of the U.S., here in San Francisco, the month unofficially ushers in Indian summer, when the fog lifts and temperatures hit their yearly average highs. Residents know this as the best season to host out-of-town guests expecting more traditional California weather, as well as an ideal time to get outside and enjoy what the city has to offer. 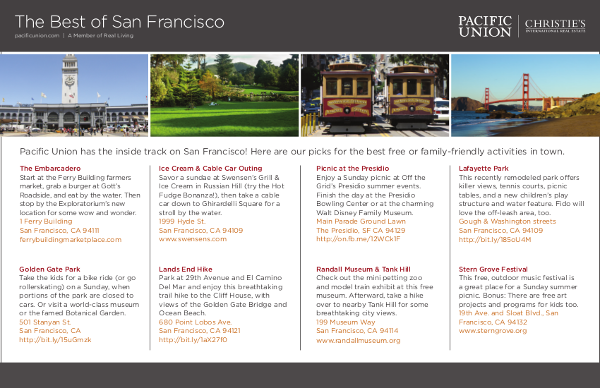 Pacific Union’s San Francisco-based real estate professionals know the City by the Bay like the backs of their hands and can offer insider tips on the top places to savor the amazing September weather. And in case the weather doesn’t cooperate on some days, we’ve also sprinkled in some indoor attractions that are favorites with the locals. Start at the Ferry Building farmers’ market, grab a burger at Gott’s Roadside, and eat by the water. Then stop by the Exploratorium’s new location for some wow and wonder. Take the kids for a bike ride (or go roller-skating) on a Sunday, when portions of the park are closed to cars. Or visit a world-class museum or the famed Botanical Garden. Savor a sundae at Swensen’s Grill & Ice Cream in Russian Hill (try the Hot Fudge Bonanza), then take a cable car down to Ghirardelli Square for a stroll by the water. This recently remodeled park offers killer views, tennis courts, picnic tables, and a new children’s play structure and water feature. Fido will love the off-leash area, too. Park at 29th Avenue and El Camino Del Mar and enjoy this breathtaking trail hike to the Cliff House, with views of the Golden Gate Bridge and Ocean Beach. Enjoy a Sunday picnic at Off the Grid’s Presidio summer events. Finish the day at the Presidio Bowling Center or the charming Walt Disney Family Museum. Check out the mini petting zoo and model train exhibit at this free museum. Afterward, take a hike over to nearby Tank Hill for some breathtaking city views. This free, outdoor music festival is a great place for a Sunday summer picnic. Bonus: There are free art projects and programs for kids too.